The new Porsche Panamera plug-in hybrid will debut at the Paris Motor Show this month, featuring a 456bhp four-wheel drive setup with CO2 emissions of 56g/km. Based on the latest generation of the grand tourer, the Panamera 4 E-Hybrid will launch across Europe next year, with first deliveries due in Germany from April. The drivetrain combines a 326bhp 2.9-litre biturbo V6 petrol engine with a 134bhp electric motor, the two sources sharing a new eight-speed dual-clutch PDK transmission to power all four wheels. Its predecessor had been two-wheel drive. 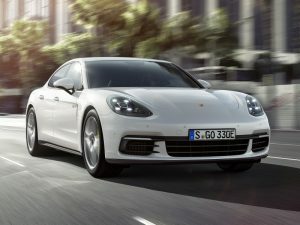 Porsche has increased the battery capacity from 9.4kWh to 14.1kWh without any weight gain, and the Panamera now features an optional 7.2kW charger for full top-ups in 3.6 hours. The battery offers an electric range of 31 miles to a full charge, which means 112.9mpg fuel economy and tax-friendly 56g/km CO2 emissions on the NEDC combined cycle. Also new to the 4 E-Hybrid is a Hybrid Auto mode, which intelligently switches between petrol and electric power, or uses the motor to assist the engine, to minimise fuel consumption. Selectable driving modes can also prioritise full performance, or completely electric driving, to suit the route ahead. Pricing starts at €107,553 (£91,000) including VAT, in Germany. UK prices have not been announced yet.